After a break of one year, it was business as usual back at Worthy Farm site for this year’s Glastonbury Festival. RG Jones once again turned to the tried and trusted Martin Audio W8 Longbow system, which again dominated the Pyramid Stage. 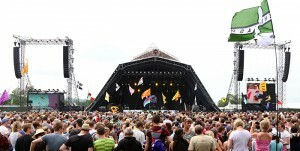 With visiting artists and sound engineers so complimentary about the sound system two years ago, specialist sound company RG Jones had no hesitation in fielding a similar PA rig, knowing that this would meet all compliances and propagation tests set by the acoustics consultants and organiser Michael Eavis … and at the same time satisfy the vast crowds of around 150,000 who converge on the site for the four day extravaganza. The Longbow hangs are now a familiar sight, book-ending either side of the iconic Pyramid, having fulfilled similar duties for the previous four festivals. Once again dual inner and outer PA hangs comprising 14 W8L Longbow elements per side, with two W8LD Downfills at the base provided the full range dynamic — making 64 boxes in total. However, this year RG Jones changed the subwoofer design from the Martin Audio WS318X (3 x 18in) subs fielded in 2011 back to 54 of the WS218X (2 x 18in) enclosures used previously — still maintaining an electronically curved, cardioid broadside array configuration. With the subs delayed incrementally from the centre outwards, the overall wavefront was tuned to fill the Pyramid Stage area, and ensure that spillage beyond the site perimeter was minimised. In addition, two clusters of four W8LC Compact Line Arrays, situated at each end of the crash barrier, provided nearfield infills, and four delay masts each comprising a further 16 W8LC’s were positioned 100m back from the downstage centre, split into an arc. “This solution worked great,” said Milton. “The organisers wanted to leave nothing to chance when it came to maintaining levels and this was virtually a carbon copy of the 2011 system. We had plenty of opportunity to walk the field and conduct measurements, to ensure the accuracy of the system,” he said. This is the domain of seasoned PA system technician Mark Edwards, who has vast experience with all Martin Audio’s premier systems. He was an essential member of RG Jones’ specialist team, which included Steve Carr and Damian Dyer at FOH (with the vastly experienced Simon Honywill occupying more of a ‘floating’ role this year). Down at the stage logistical duties were shared by Ben Milton (who also mixed monitors for some acts) and Mark Isbister. Supporting the system throughout was Martin Audio’s R&D director, Jason Baird. Summing up, Glastonbury veteran, Simon Honywill, could not have been more positive, “This year’s Festival was the most professional, slick, calm, enjoyable experience I can remember at an event of this stature. The only thing Glastonbury lacked, reflected Honywill, was [sound engineer] Steve Watson, who sadly died the weekend before. “He is sadly missed, and the industry won’t be the same without him,” he said in tribute.